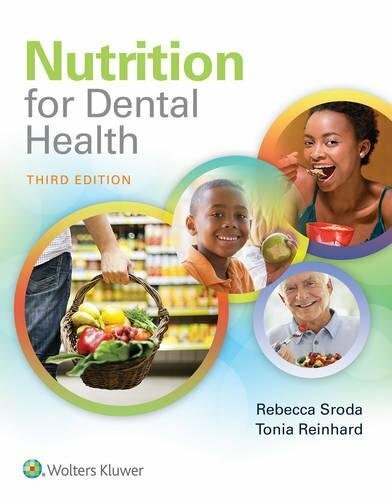 Reflecting significant changes in the industry and the latest research in the field, this fully updated 3rd Edition of Rebecca Sroda’s Nutrition for Dental Health provides dental hygiene and dental assisting students up-to-date, easy-to-understand coverage of basic nutrition and diet information with an emphasis on the relationship of nutrition and diet to oral health. Now in vibrant full color, this accessible and student-friendly 3rd Edition features up-to-date, evidence-based content, new practice-focused features, outstanding end-of-chapter and online learning tools, and enhanced instructors resources. New Videos on Chairside Counseling, filmed by the author, bring to life the how-to’s of patient counseling. One of the chairside counseling videos will be available in Spanish. New chapter on Complimentary Nutritive Therapies introduces students to alternative ways that patients prevent and treat their oral concerns using everyday nutritive remedies. New instructor resources; include Voice-over PowerPoint Presentations,Critical Thinking Activities,and a downloadable Comprehensive Patient Forms Booklet. New student ancillaries, including Chairside Counseling videos, electronic flashcards, and a Chairside Counselingquick reference card, provide opportunities for interactive review and practice. MyPlate (and MiPlato) coverage replaces the 3rd Edition’s Food Pyramid to align with the latest USDA recommendations on encouraging lifelong healthy eating behaviors. Evidence-based research supports content and ensures the currency and accuracy of the book’s coverage. A new full-color design and art program includes graphics, illustrations, and photos to engage today’s extremely visual learner. New content on the relationship between nutrition and periodontal/oral disease in Chapter 3 is written/contributed by, best-selling author Jill Gehrig. Current information on vitamins and minerals demonstrates their effect on oral disease. New co-author: Registered Dietician Tonia Reinhard gives a dietician’s perspective, solidifying the scientific aspect of the book. Food for Thought boxes provide interesting, real-life, need-to-know information. An entire unit (Part VI) dedicated to nutritional counseling prepares students for a key role of practicing dental hygienists. A friendly look and tone throughout the book draws students in and make the subject of nutrition interesting and lively. Nutrients-at-a-Glance charts contain common categories of information to help students organize and compare major nutrients and herbs. Charts can be found in the appendix.